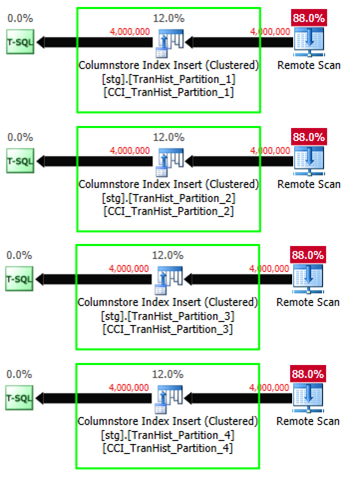 In this blog post, I would like to describe two case scenarios of bulk loading data, using SSIS, into a partitioned table that has a clustered columnstore index (CCI). 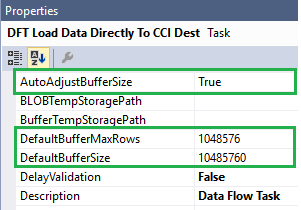 Bulk loading data from the source table directly into the partitioned table with a CCI. 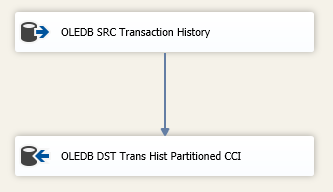 Bulk loading data from the source table into the staging tables (one staging table per partition) with clustered columnstore index followed by the partition SWITCH operation to the destination partitioned table with a CCI. 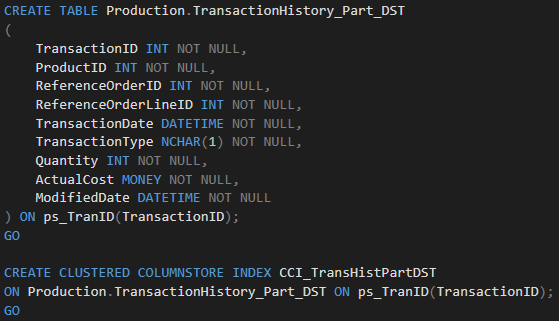 In this case scenario, we bulk load data directly from the source table named Production.TransactionHistory_SRC that contains 16 million records into the partitioned target table named Production.TransactionHistory_Part_DST that has a clustered columnstore index (CCI). We will be loading 16 million records from the source table into the 4 partitions (4 million records into each partition). Note: The first partition where PartitionKey <= 0 will be empty as well as the last two partitions (where PartitionKey > 16 million and PartitionKey > 20 million). As the next step, I have created an SSIS package with a Data Flow task that loads data from the source table into the destination table. Let’s start the SSIS package. 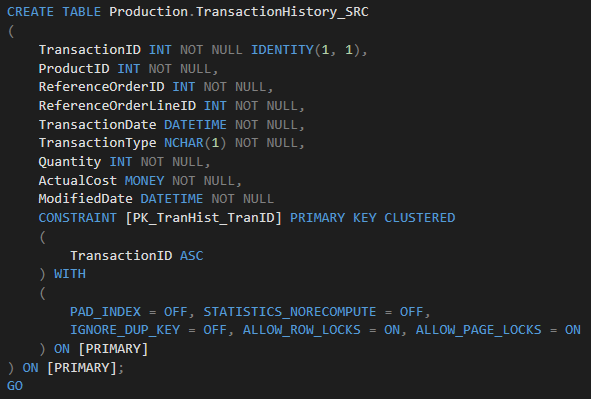 During the execution, we can observe an expensive and blocking sort operation in the Live Query Statistics – even if the OLE DB Source component has the option IsSorted set to True! As we can see, the first approach was not efficient enough, so let’s think about another way of loading data, ideally, without an expensive blocking Sort operation. What if we bulk load data into the staging tables (each with a CCI) first, and perform the SWITCH operation into the destination table then? 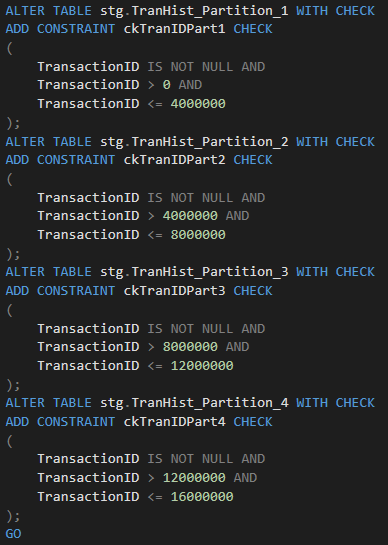 In the real world, the amount and definition of table partitions will change, and the conditions to split/distribute the data from our source to the destination will change over time so we need to make the solution more generic. 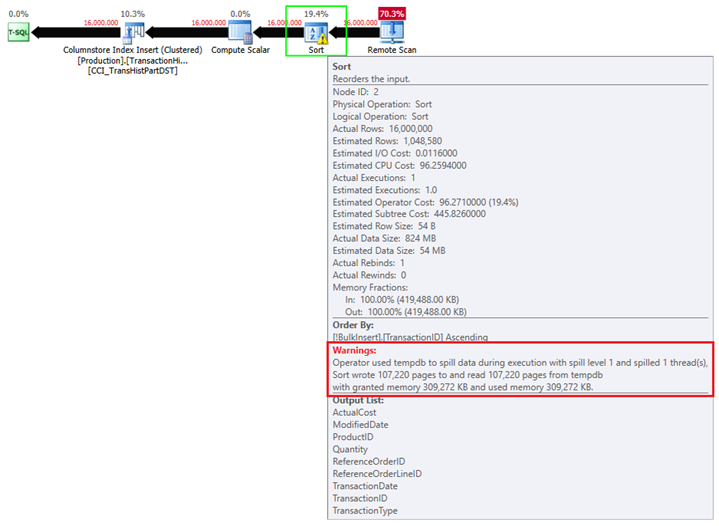 SSIS package (and the split conditions) can be also generated automatically using BIML. 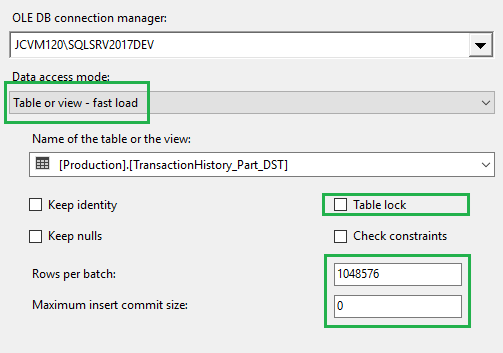 Every time you are bulk loading data into a (partitioned) table that has a CCI, ensure your SSIS package is configured properly. 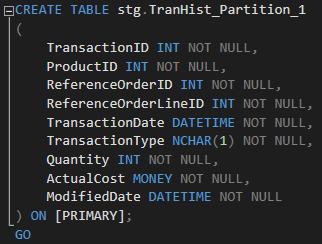 Bulk loading directly into a partitioned table will trigger an expensive and blocking sort operation, even if there are no indexes on the table or the incoming data has an ORDERED hint. perform the SWITCH operation into the destination table with a CCI.